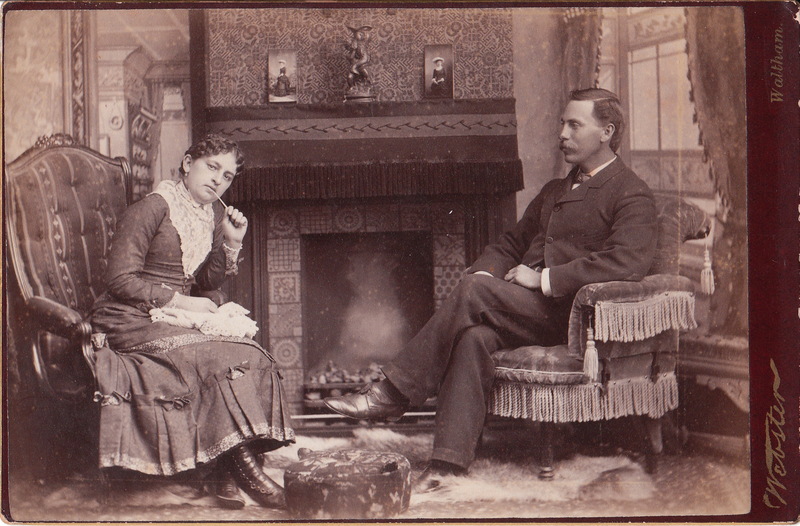 This cabinet card photograph captures a couple sitting in front of fireplace in a comfortable looking living room. The photograph is quite remarkable. First, the photograph features a setting that could easily be perceived as a real living room. It is as if the photographer went to this couples house to photograph them. The cabinet cards on the mantelpiece is a great touch of realism as is showing the woman with a crochet project on her lap and the end of the crochet hook in her mouth. She is either sucking or chewing on the hook, the way many people mouth a pencil or pen. There isn’t much to say about the man in this photograph. He seems oblivious to the photographer and intent upon staring at his wife. It looks as if he is admiring his wife and wondering how he found such a great woman. Back to the photograph’s setting. Upon close observation, it is apparent that this is a studio photograph that utilizes an extraordinary backdrop. This may be one of the best backdrops I have seen in cabinet card photography. The photographer of this wonderful image is William Alexander Webster (1857-?) and his studio was located in Waltham, Massachusetts. Webster was born in Ontario, Canada. He married Sheloa (also spelled Schola and Shelor on census) Slipp in 1879. Photographs he took in the early 1890’s of the American Waltham Watch Factory are considered important historic records of the company and the city of Waltham. At the time these images were taken, Webster operated his gallery from 111 Moody Street in Waltham. Mr. Webster was not only an able photographer, but he was also very politically involved in photography organizations. The Anthony Photographic Bulletin (1899) stated that Webster was on the “Committee on Nomination of Officers” for the Photographic Association of America. According to Wilson Photographic Magazine (1908), he was the Vice President of the Photographers Association of New England. A number of sources report that he was the organization’s President in 1909.